You cannot listen to the pronunciation of lie because your browser does not support the audio element. row"Why are some translations grayed out?" Grayed-out terms are meanings of the character which cannot be used as translations. For example, 必 (bì) has the meaning must / to have to. However, the Chinese translation for "must" is not 必 (bì) but 必须 (bìxū)., to arrange, to line up, various"Why are some translations grayed out?" series"Why are some translations grayed out?" Grayed-out terms are meanings of the character which cannot be used as translations. For example, 必 (bì) has the meaning must / to have to. However, the Chinese translation for "must" is not 必 (bì) but 必须 (bìxū)., kind"Why are some translations grayed out?" Grayed-out terms are meanings of the character which cannot be used as translations. For example, 必 (bì) has the meaning must / to have to. However, the Chinese translation for "must" is not 必 (bì) but 必须 (bìxū)., sort"Why are some translations grayed out?" Chinese character and stroke order animation"How do I write 列 ( liè ) correctly?" 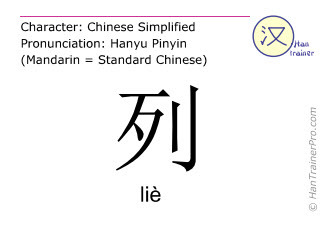 The traditional Chinese characters of liè are identical with the modern (simplified) characters displayed above. 列 is composed of 6 strokes and therefore is of low complexity compared to the other simplified Chinese characters (average: 13.1 strokes).